With Club Nintendo in the middle of its farewell run, members are in their final few months in which they can spend their stars and coins. The North American platform has gone big with various rewards and downloadable games, and after a bit of a delay Nintendo of Europe recently got in the act with its own range of download games. We've seen some previous favourites gradually return, too, and today Nintendo has confirmed a couple of soundtrack CDs that are making their comeback on Club Nintendo in Europe. 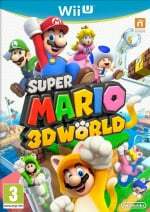 Available for 3000 and 2000 stars, respectively, we have the soundtracks for Super Mario 3D World and Kirby: Triple Deluxe. Both are decent additions in this Club Nintendo run-in. Will any of you in Europe be splashing some stars out on these? I'm still holding off, in case the Gold/Silver Mario amiibo are rewards. Anyone who hasn't got the 3D World soundtrack yet should get on it asap, it's such a good ost. Already have both, though, so I'm praying for a Mario Kart 8 CD to come before September. I'm gonna hold out in case there is another statue. I already have both, waiting for Mario Kart 8 soundtrack. I wish we had sound tracks on our Club Nintendo. We only got the platinum reward Majoras Mask one. I spent all my stars on Advance Wars, which I'm not regretting. Holding out for something really special. Ah well, Elite members in NA will get to pick their free game starting Wednesday. Here's hoping that "wide selection" is just that. Finally got the Kirby one to add to my growing collection lol! If they release the Mario Kart 8 one then i'll be very happy. This is my 3rd soundtrack this year! They're all sooo good! Still jealous that North America never received these awesome rewards. Goshdarn Reggie, why can't I jam to "Attack! Boss Battle" in style? Just spent at least half an hour furiously typing out codes to get the Mario one. Already got the Kirby one, else I'd still be tearing up the house looking for unexpired pin numbers. I'm holding off. I avoided the temptation of the digital games in the hopes that a Mario Kart 8 or Hyrule Warriors soundtrack CD crops up. Had the Mario 3d World cd from when it was last available, and just ordered the Kirby cd.. Awesome! Got my Smash soundtrack last week too, getting a nice ost collection now, hopefully the Link Between Worlds soundtrack will become available again as I missed out last time..
Was there a MK8 soundtrack available at some point? I've not seen it in UK Club Nintendo, waiting for it's release in Club Nintendo Japan some time in April.. Have exactly enough points for that and Nicky's Travel Quiz, awesome last few rewards! I'd love the 3D World soundtrack, but the CD's almost never come to America, and I've spent all my coins, with tomorrow being the end of registering products. I guess that's what ebay's for. In the meantime, I'll continue to wonder what we'll get as Platinum rewards next month. @TrueWiiMaster I thought we could register codes up until April 20th??? @DarthNocturnal I hope so too. The game selection last year was uninspiring. I'm still hoping for one last memorable physical reward but, I'm not holding my breath. Tempted by the SM3DW soundtrack, but I'd rather one of the Galaxy ones which I never got when they were up. I'm gonna hold out a while longer to see what else becomes available I think. In America it ends tomorrow. In Europe you can register products through the end of September. April 1st is when new games won't have registration cards anymore, and April 20th is when digital games won't register on Club Nintendo anymore. I'm tempted to get 3D World. I love the soundtrack. But I need more one code so my Stars will be over 9000! Who knows some amiibos or LE controllers pop up. I thought it's the last day of registration here in Europe tomorrow. Are you guys sure it'll be until September? These are great rewards. Sadly I only have 900 stars but my Zelda Soundtrack arrived today and I am happy. (my only complaint about it is that when installing it to my pc the names of the tracks are in Japanese). I'll be really bummed if the NA club nintendo gets anything cool at this point, I spent my coins on the Zelda 3DS case and the Majora's Mask puzzle because they were the most appealing at that point and I didn't want to miss that.. I have 210 coins left but I'm waiting to see if any last minute post play surveys come in, as I've been registering the last of my games all month... But I doubt any new rewards will be that cheap, I'm sorta assuming I will just get a game with it. I'd love to have that Kirby soundtrack. I'm surprised that Nintendo doesn't just put things like that on sale. Thankfully I have both, but I don't think I'm gonna have enough stars if another CD comes along; so basically I hope we only get restocks. Why won't Nintendo just put these soundtracks out for sale? Once again though, these things are plastered all over Ebay. LBW is on there for £30. No way I'm giving money to a scalper like that. @Inkling The CN guff is pretty confusing, but after tomorrow, no newly released games will come with CN points cards (no points with Xenoblades, then). After April 20th, no downloaded games will come with CN points. You can still register any valid CN points codes from cartridge games right up till 30th September. That's how it reads, but Nintendo rarely makes anything clear. Edited your post, then? No, I already have LBW, Kirby and Mario CDs redeemed with points so I won't be getting one. Supply and demand is one thing. Buying stuff up or using stars (get them all in games you purchased did you?) expressly to sell on at an inflated price is profiteering and no, I won't support that. I'd rather go without. I own the Kirby: Triple Deluxe soundtrack. Club Nintendo will end on the 30th September, but it`s legacy will live on forever! Um...when is the 3D World soundtrack coming to the U.S.? @ShadJV That's pretty much what I've decided to do...wait. At least have a few months of being able to hold onto coins and see. Probably won't be anything, but who knows...I'd love to see something pop up randomly for those who are patient to hold out, honestly. I'm not surprised that it's only for Europe at the moment. I wish the U.S. got it too. hey europeans, I'll buy this CD from you! call me! Awesome! I missed out on the Kirby soundtrack when it was last available (I was able to get the Mario 3D Land soundtrack previously though). I knew sooner or later that there would be something I really wanted on the Australian Club site. Thanks Nintendo! I still have over 5000 stars as well - which is a lot in Australia (meaning that I can still get that something special [if there will be one], fingers crossed)! @Achoo Yeah, sure you did. @Achoo Why are you so desperate to convince everyone you're an okay guy? The only thing that confirms is that you're not entirely sure of your standpoint. You go ahead and soothe your ego by making it seem like anyone who disagrees with you has simply misunderstood the nature of Capitalism. I don't care, frankly. I'm just pointing out that it's a scumbag thing to do to buy up stuff with the express intent of selling it on at a massive profit and at far higher than an item is worth.